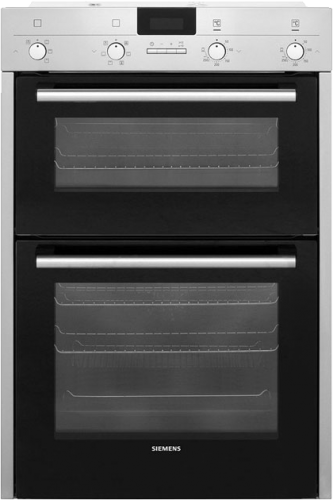 If you’re looking for a feature rich multi function double oven, then the HB43MB520B is exactly what you need. This state-of-the-art appliance boasts 5 unique functions in the main oven, and 3 additional functions exclusive to the secondary oven. One such function is the timer. Not just any timer mind you, but an intelligent timer which can stop the cooking process in its tracks. Convenient, much like another feature known as ecoClean. This one is very smart; the internals of each oven are coated in a special material which makes cleaning an absolute breeze. In fact all you need to do is wipe the sides down occasionally. No scrubbing, no chemicals, no fuss. The future is here, at long last. Want to cook sweet and savoury items at the same time, without compromising the taste of either one? The fabulous 3D Hot Air function is your answer. Using patented air shaping technology, the stream of heat is kept entirely separate for each shelf. It’s such a simple idea that we have to wonder why other manufacturers don’t do this. Finally, specially treated heat reflective glass helps to keep the high temperatures inside where they belongs. There’s nothing worse than cooking during hot summer evenings, and this endeavours to make that experience just that little bit easier.